Grouper: We catch several species of grouper in the deep sea waters off Cape Canaveral. Gag (gray), scamp, snowy and red are the main targets, but we also catch warsaw and speckled hind that have to be released. All of the groupers are hard fighters and are known for diving into the rocks or other structure when hooked. If the fish isn’t pulled away from the structure immediately, the fight will likely end early with the angler losing a hook and leader. Like the snappers, the grouper is one of the prime targets when bottom fishing. One small problem while grouper fishing is that the abundant red snappers will often eat the bait intended for the grouper. 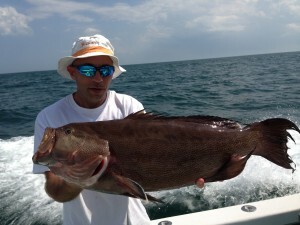 Grouper Fishing Tips: Bottom fishing is the primary way to target grouper. Depending on conditions, the boat can be positioned over structure either by drifting or anchoring. The best bait is undoubtedly live bait, but they will also eat a variety of cut bait and squid. Also, jigs can work well, both the traditional style and the new vertical jigs. With respect to edibility, grouper takes a back seat to no other. Cook it however you want.